"Let all who enter Windhelm know of us. We laugh at death and thirst for life. Be not afraid, but instead enter bravely and live well..."
Windhelm is a city-state located in eastern Skyrim, near the border of Morrowind. The ruler is King Asgan. Its rivals are Riften and Winterhold. 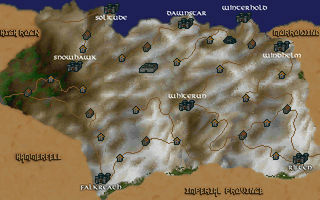 Windhelm is a possible starting location for Nords.